My stitching group has been together for several years now. We meet once a week and stitch and chat and have a good time. Recently one of our members had a big birthday. We decided to acknowledge it the best way we knew how, by stitching something special. 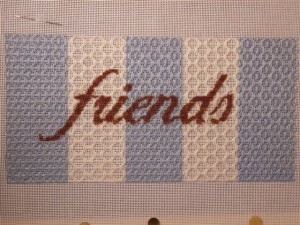 We started with the “friends” canvas by & More. We devised a stitching plan and each one of us stitched a stripe. Nancy, who many of you know from the shop, did all of the beading. We gave it to her recently at one of our stitching gatherings. She was so surprised and touched. It was a wonderful way to celebrate. If you think you might want to do something similar, call the shop(203-210-5107) and we can help you with your surprise! What an amazing group. Love the stitches you used. Possible to get the canvas and stitch guide for those. Absolutely! I’ll write that stitch guide up when I get back from market. The canvas is $40. The thread kit is $35. The stitch guide is included at no extra cost with the purchase of the canvas and threads. The stitch guide would be $10 if purchased individually.